We had a great time and got a lot done on Saturday. The Tree lot is ready. The poles are in place. The cook tent is up behind the scout house and the lighting is up. All we need are the trees, and we’ll have those on Tuesday (tomorrow as I write this). Not only did all this work get done, but we also enjoyed some donuts and a little bit of touch football. 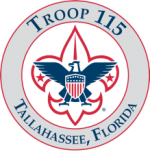 Thanks to all our Troop 115 scouts and our partners from Troop 118. We had a fantastic day.